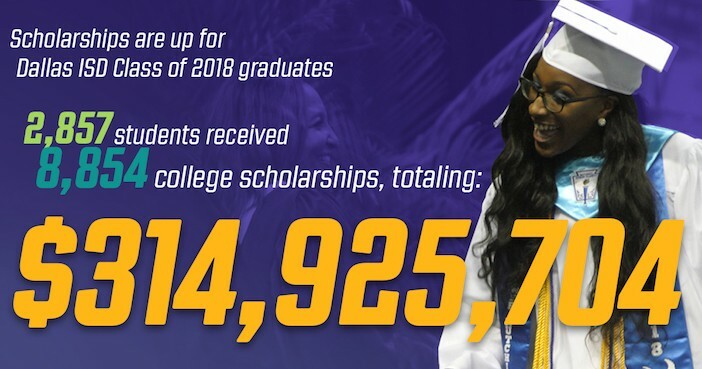 The Dallas ISD Class of 2018 has reported receiving more than 8,854 different college scholarships totaling $314,925,703. More than 4,500 students in the Class of 2018 reported applying for scholarships. The Dallas ISD Class of 2018 reported receiving more than $314 million in college scholarships. The scholarship data is self-reported by seniors to their high school counselor or college access advisor. The scholarships include one-time and renewable scholarships from private donors and public and private colleges/university. The scholarship numbers are up from the previous year, when the Dallas ISD Class of 2017 initially reported receiving 5,728 scholarship or institutional grants totaling nearly $212 million. The increase is due in part to more seniors applying for scholarships and the number of students participating in the Dallas County Promise, which offers full-tuition scholarships for students to attend a Dallas County Community College District campus. Meanwhile, at least 62 percent of seniors in the Class of 2018 completed the Free Application for Federal Student Aid (FASFA), which opens the door to scholarships, grants, work study, and low-interest loans. This marks a 3-percent increase from the previous year.